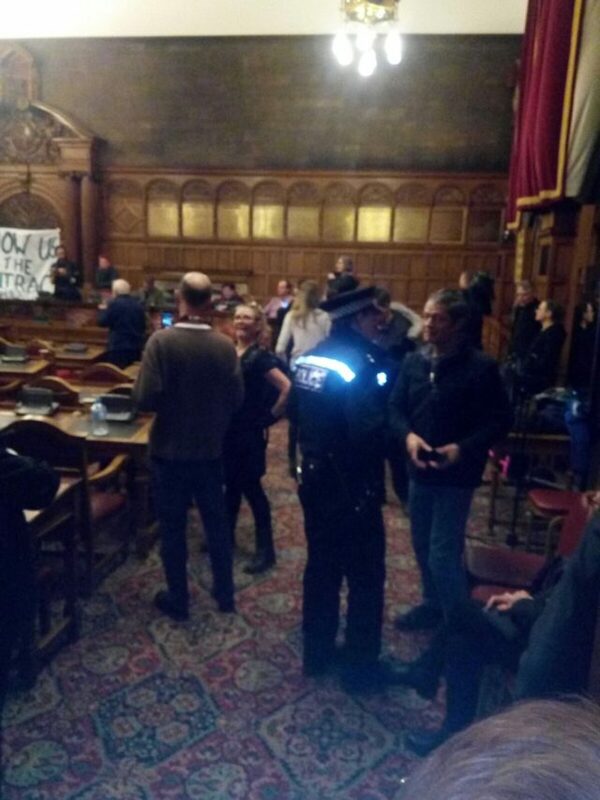 Protesters against controversial plans to cut down trees in Sheffield have occupied the city council chamber. A group of around 20 people descended from the public gallery at the end of a council meeting which finished at around 8.30pm on Wednesday. Police were called to the building and were negotiating with the occupiers who insisted it was a peaceful protest and there would be no damage. 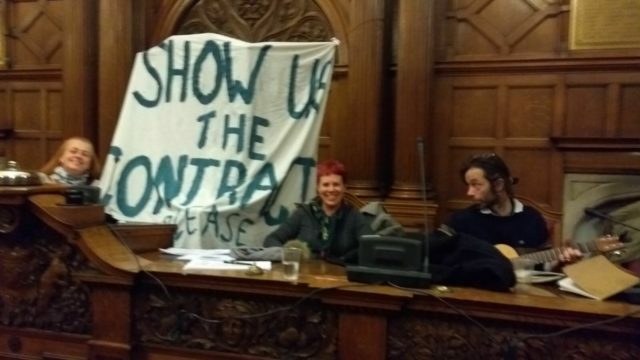 They held aloft a banner saying “Show us the contract please” – a reference to a £2.2 billion Private Finance Initiative deal with contractor Amey. Russell Johnson, of Sheffield Tree Action Groups (STAG), said: “We attended the full council meeting which is open to the public. “We asked questions of the councillors, seeking democratic accountability. He said the occupiers may stay all night. They were in discussions with the police and there were no elected members still there. “There’s about 20 of us, we have a musician and a poet here, and it’s all friendly and fine,” he said. The ongoing and long-running row over Sheffield’s street trees has seen daily demonstrations in some of the city’s leafiest suburbs. The dispute has its origin in a 25-year PFI deal the council signed with Amey in 2009. The council says only a small proportion of the city’s 36,000 street trees are being removed because they are diseased or dangerous, and all are being replaced. But protesters say many of the trees are being felled because their roots are getting in the way of the resurfacing methods used by Amey.